The unit will accept 237SUA assemblies for notching rounds, squares, rectangles and special shapes of tubing and pipe up to 2” standard (2-3/8” OD x .154” wall). This spring loaded, spanker style unit is manufactured of hardened steel for many years of maintenance free service. Unit can be used in the 237HP Hand Press, mechanical press, iron workers or any of our hydraulic presses we offer. These assemblies are manufactured to the specific application notching one wall per press stroke, per tube end. Manufactured of hardened steel for years of maintenance free service. 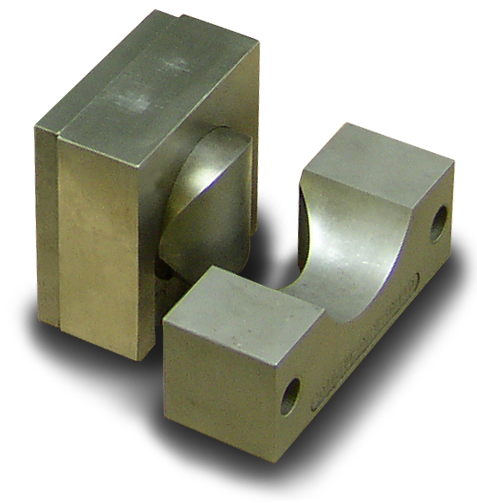 Cutting members are manufactured of hardened D-2 tool steel and are easily removed for sharpening purposes. Assemblies can be manufactured for conventional notching of tubes to fit another tube of equal or different diameter for 90º joints. Can also be used to produce slots, v-notches, and many other configurations on tube ends within the capacity of the unit.